Click on picture to download the report. 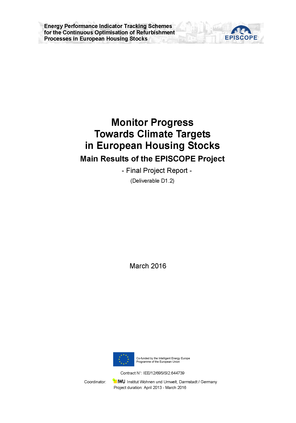 The objective of the EPISCOPE project is to make energy saving processes in the European housing sector more transparent and effective with the aim to ensure that the climate protection targets will actually be attained and that corrective or enhancement actions can be taken in due time, if necessary. Residential building typologies for 10 European countries were further developed and new typologies for 6 more countries were elaborated. In this context, the common typology scheme was extended to additionally include showcases of new buildings exemplifying energy performance levels meeting current national requirements or, as alternatives, more ambitious standards up to nearly zero-energy building (NZEB) level. As one of the key elements, scenario calculations for residential building stocks on different scaling levels have been conducted in various European countries. Some of these typology-based case studies focused on selected housing portfolios on local level, others on entire regional or national housing stocks. Trend and scenario results for CO2 emission reductions were compared to national and/or European benchmarks with the aim to identify the necessary path for attaining the targets. The monitoring procedure and the concerted set of energy performance indicators developed during the project aims to enable key actors and stakeholders on different scales to ensure a high quality of energy refurbishments, the compliance with regulations, to track and steer the refurbishment processes in a cost-efficient way and to evaluate the actually achieved energy savings.